Bhubaneswar: A great milestone created by KIIT University as it received the prestigious Institution of Engineering and Technology (IET), UK Accreditation for its B.Tech Degrees. This stupendous achievement is yet another reflection of the world class quality of education provided by KIIT University. Presently KIIT is the only University in India to get such kind of accreditation. 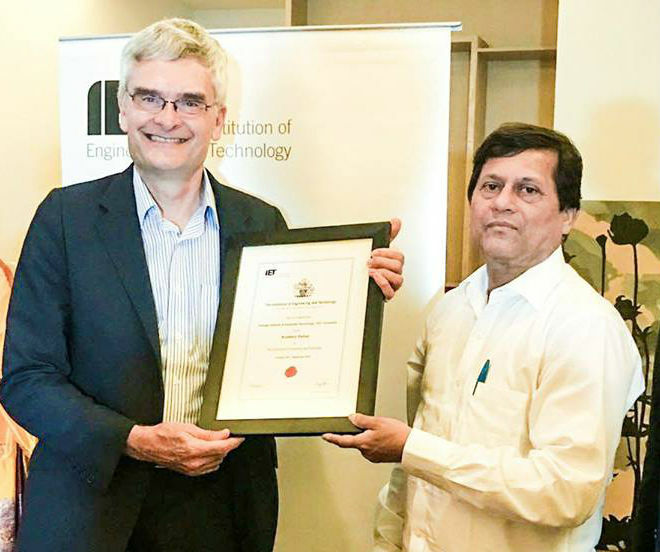 Jeremy Watson, President IET UK and Nigel Fine, Chief Executive IET UK gave this coveted certification to Prof. Achyuta Samanta, Founder, KIIT & KISS in Bangalore on 15th September. KIIT University has got it till 2022. The process of getting Accreditation is rigorous and our efforts for this started way back in 2013. It is second most prestigious Accreditation for Engineering. IET Accreditation is an internationally respected benchmark awarded to high quality programmes that provide an ideal preparation for aspiring professional engineers. The IET accredited courses are at par with UK and internationally. It is looked favourably by the employers and increased the career prospects.